The Old Bro Network: Old Bro Nation adds 300th member !! Not quite two years old yet, the Old Bro Network is happy to announce the 300th member to the roster, please welcome Tim Bryant (EpSig 548). Tim is a "late 60's" bro, who heard about the Old Bro Network from Nick Svetcoff (EpSig 746) and sent in his contact info. Nick therefore earns the coveted title of "Stud of the Week" for his efforts in helping to expand the Old Bro Network. My name is Michael Ta and I recently graduated this June and would like to join the old bro network and be part of the Epsilon Sigma's legacy/studliness if that's all right. As a recent alumnus, I would like to thank all of the older brothers for helping us throughout these years. We wouldn't have achieved everything that we achieved without the assistance of the older brothers. Have a great day and looking forward to alumni events! The next addition to the roster is another "In Memoriam" tribute to John Dukes (EpSig 383) who left us in March 2011. Special thanks to Stan Benson (EpSig 305) for making us all aware of this news. Old Bro Network always remembers our fallen brothers, and will add John's name to the directory in tribute. Finally, please note that Old Bro Jim Hester (EpSig 641) has officially joined the ranks of the retired Old Bro's, his updated e-mail address has been distributed to all. This now brings the total roster count for the Old Bro Network to 302. Soon we will be promoting another "OLD BRO FALL RUSH" campaign, so check your address books for any Old Bro's who are NOT currently on the roster and be ready to send their contact info in. Right back at ya, Coach !! 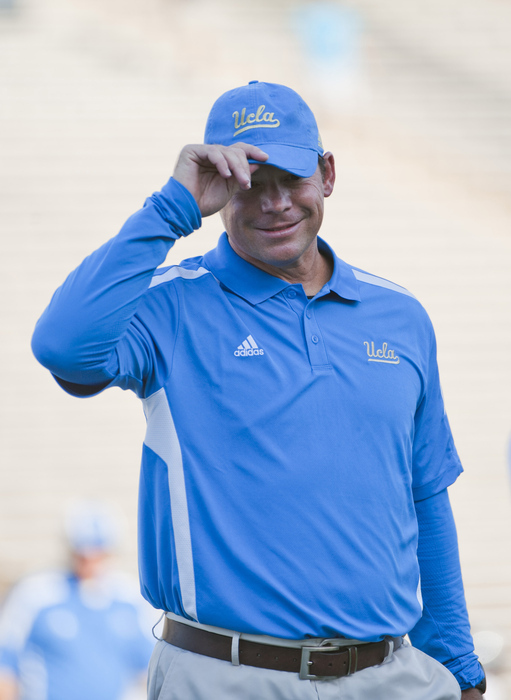 A tip of the cap and congratulations to new UCLA head football coach Jim Mora (a Lambda Chi) on the Bruins season opening 49-24 win over Rice. Yeah, I know it's only Rice, but ANY win these days is something to celebrate ..... good luck to Coach Mora and the Bruins for their home opener this weekend against Nebraska, if you get the chance, head out to the Rose Bowl and cheer on the Bruins !! There is also a post-game fireworks show to watch, let's hope the Bruins can provide some fireworks DURING the game as well ! !